Matt Harmeyer, Melissa Branson and Tony O’Neil represented IU Southeast at the 2017 CFA Research Challenge in Louisville, Ky.
(NEW ALBANY, Ind. 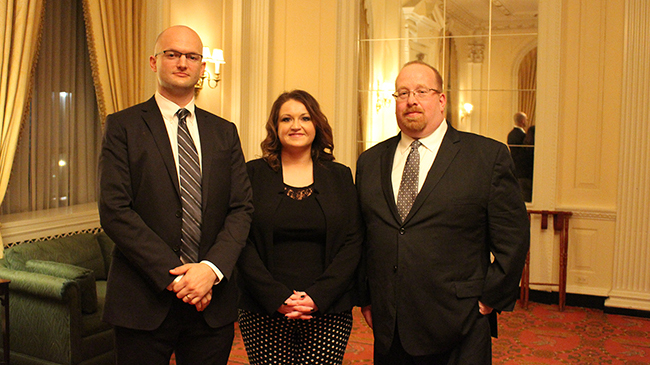 )—Last week IU Southeast business students Matt Harmeyer, Melissa Branson and Tony O’Neil represented the university at the annual CFA Research Challenge in Louisville, Ky., making it to the finals and gaining valuable experience along the way. While winning the world championship is a great honor, the competition is conceived as an educational initiative to build best practices in equity research via hands-on mentoring as well as training in company analysis and presentation skills. Over the course of four months, student teams dissect a corporation and deliver an investment recommendation based on exhaustive research into corporate structure and performance, and best valuation practices. Competing at last week’s regionals at the Pendennis Club in Louisville were ten teams, including IU Southeast and IU Kelley School of Business. Joining IU Southeast in the final round were teams from the University of Louisville, University of Kentucky and Butler University, the eventual winner. IU Southeast was advised by industry insider Phil McCauley, senior partner of The Madison Group at Morgan Stanley in Louisville. An investment professional with more than 25 years of experience who has been named one of the nation’s top financial advisors four times by Barron’s, McCauley has advised previous IU Southeast teams, and was excited to join this year’s effort. For McCauley, the competition brings heightened visibility and intensity to the development of key skills of the career. This year, the finance teams zeroed in on Columbus, Ind.-based Cummins. While known for its diesel and natural gas engines, the company is a complex organization with other units devoted to components, power generation systems and distribution ventures. Cummins and its ventures operate in 190 countries, though its place in a rapidly changing global market is not clear-cut, opening the door for a divergence of views on its present and future prospects. The team came together in late November: Harmeyer, a second-year M.B.A. student from Indianapolis, Ind. ; Branson, a first year M.B.A./M.S.S.F. student from McDaniels, Ky.; and O’Neil, an M.B.A. student graduating in May, of Charlestown, Ind. As part of their preparations, the team visited Cummins headquarters in January. They met with management, with whom they discussed a range of issues including the company’s acquisition strategy and the amount that the company is preparing to spend to acquire new divisions. They also absorbed company culture, which gave them a sense of the personality of the Cummins brand, itself an important factor in assessing the value of its stock. From there the team divided up the work. While Harmeyer took on the overall development and leadership of the team and subjected the numbers to different analytical models, O’Neil focused on parts of the valuation and the risks to the team’s recommendation. Branson completed the industry research and peer analysis, evaluating Cummins competitive position. She also helped gather data and forecast growth rates. “The competition ultimately demanded that each of us learn and absorb information at such a rate that we moved from a state of conscious incompetence to unconscious competence very quickly,” Harmeyer said. Over the course of three months, the team met frequently throughout the week and every weekend to wade through the dense financial data, making heavy sacrifices to be able to win the time. All of them have demanding jobs—Harmeyer is a business consultant at Humana, Branson is a project program management consultant at NTT Data Consulting, O’Neil is senior financial analyst at NTT Data Consulting. “We each had to find a new normal for ordering our days and the competing demands of friends, family, school, and work,” Harmeyer said. Branson, a working wife and mother to an infant in addition to being a full-time student, the sacrifices were taxing but the rewards were never in doubt. “This was a great opportunity and afforded me the chance to learn new concepts, and opened my eyes to an area of finance—valuation—that I now have a deep interest in, and see as a possible career path,” Branson said. The team completed the comprehensive financial analysis of Cummins in February, then prepared for the oral defense to be held on March 1. Every analysis culminates in a recommendation to hold, buy or sell stock. Each team chooses a different route to the destination, based on its understanding of what aspect of a company is critical to its success, and how that aspect is likely to fare in the future. The IU Southeast team concluded that the North American heavy-duty truck engine business was a key driver of success or strain at Cummins, a finding that led the team to base its analysis on the business cycle, performance and prospects for that unit. Along the way they considered the ratio of operating margins to the cash returned to shareholders, the impact of emission standard changes, the stability of component suppliers, the relationship of equity to capitalization, the role of debt in the level of share repurchase, and countless other aspects. “We became very attached to the final product,” O’Neil said. That final product was only partly the document, PowerPoint and oral defense. It was, in even greater measure, the personal and professional growth associated with the journey. “I learned so much through this experience,” Branson said. “I want to be a role model to my son and show him you can do anything with hard work, dedication, and perseverance. For O’Neil, the best part was working with different personalities, and making one another better. “It was an intensive lesson on teamwork, as well as a chance to learn in-depth about a wonderful local company,” O’Neil said. Harmeyer found the exercise added an element to the learning process that would be difficulty to replicate in a classroom: pride. “I am proud to be a student in the MBA program at IU Southeast, and I hope that our success, our drive and our example shine a bright light on current, former and future students who share our degree,” Harmeyer said.